How does one put into words twenty-five years of weekly gatherings — friends who play music together, share meals, and visit in the beauty of nature? A picture is worth a thousand words, and a documentary will bring these shared experiences to life, capturing the essence of village culture juxtaposed against an urban backdrop. To date, we have raised over $5,000 toward our goal of $25,000 to produce this very special documentary. Please consider contributing. Use the DONATE button to the right. Tunas Mekar are producing a documentary about our first 25 years, focusing on the group’s origins, history, current membership and plans for the future. Our tale, at its core, is about the power of community and how music can act as an architect of human connection. We are asking for your support to help us achieve our goals. Although we are committed to completing this project with the funds we have raised (and with hundreds of volunteer hours), we will have to cut back on our original vision unless we can raise additional funds. Please help us meet our original goal by donating today. 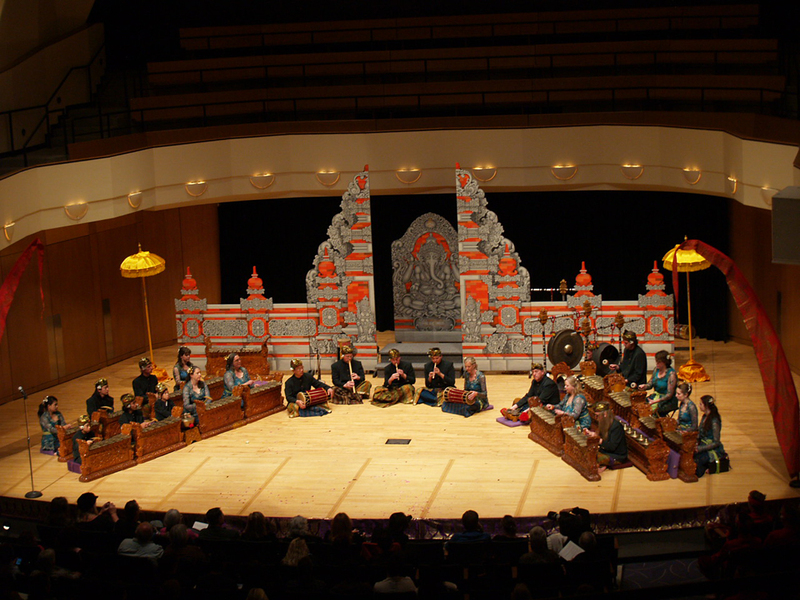 Gamelan Tunas Mekar is a community performing arts organization based in Denver, Colorado, USA. For twenty-five years, it has studied and presented new and traditional Balinese music and dance to audiences throughout Colorado, in Bali, and around the United States. Tunas Mekar’s public appearances range from providing educational shows and workshops to K-12 schools and Universities, to participating in community fundraisers, public festivals and staging its own large theatrical concerts. 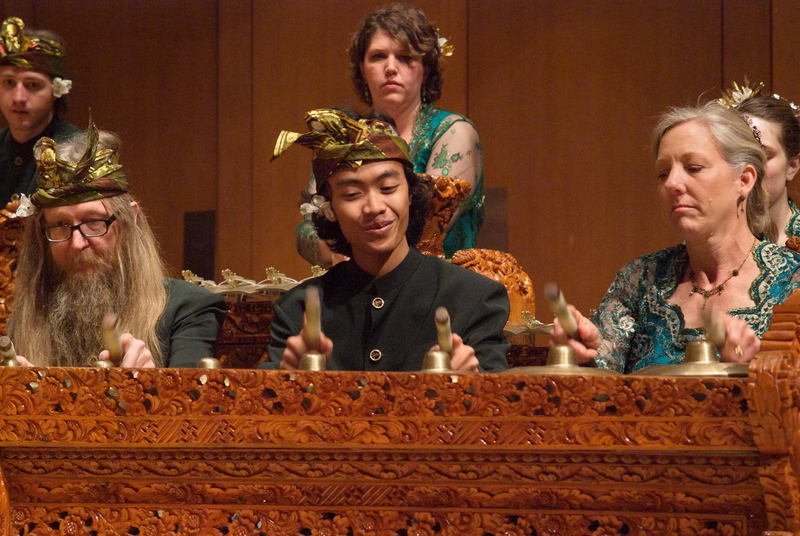 Gamelan Tunas Mekar performing in 2012 at the King Center in Denver, Colorado. Photo by Charla Bevin. Our tale, at its core, is about the power of community. In 1988, a group of music enthusiasts were brought together by a collective love of music from the other side of the world. 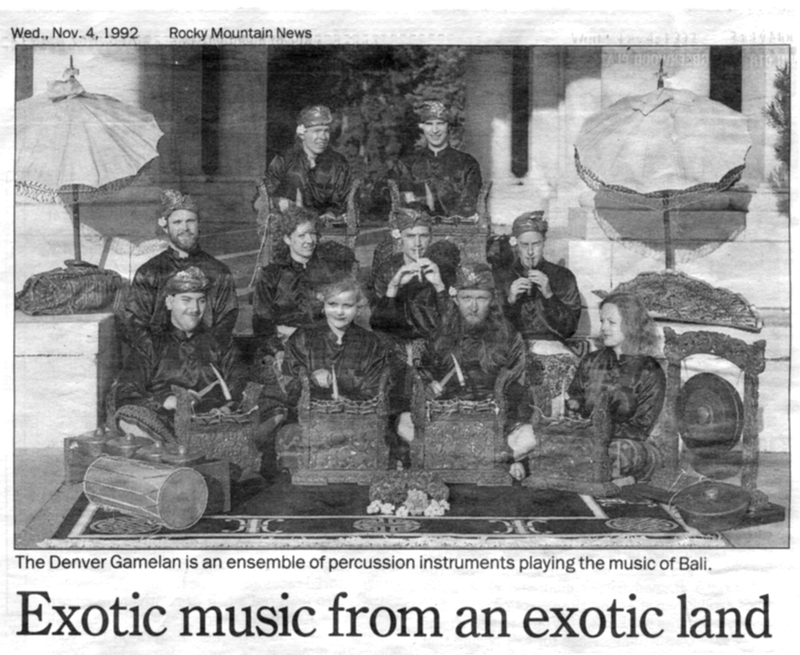 Gamelan Tunas Mekar’s performs as “The Denver Gamelan,” November, 1992. Photo by former member Brian Arnold. 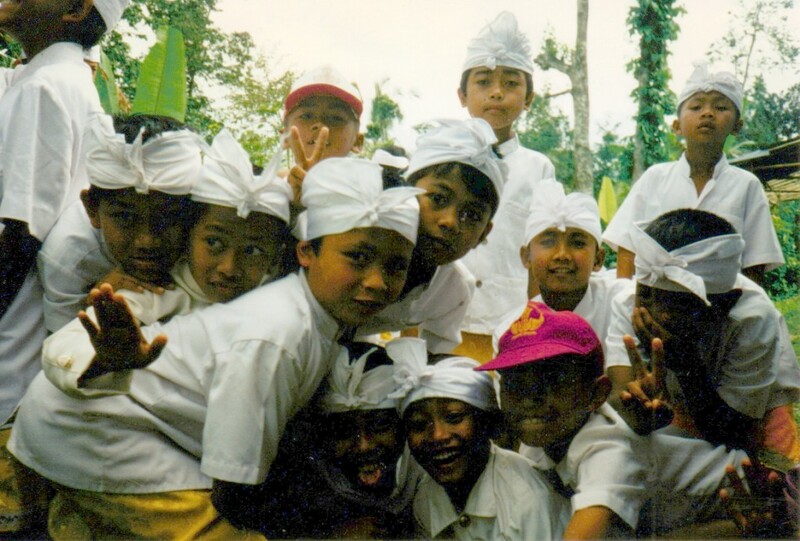 Since those early days, the group has grown and experienced many transitions, we’ve participated in cross-cultural meetings, seen friends come and go, watched “gamelan babies” grow from infants to adulthood, and now we’re at a point where a new generation is coming in and the group is once again reinventing itself. All of this represents different facets of what it means to create and be part of a community. All together, the story of Gamelan Tunas Mekar, is a story about how music can act as an architect of human connection. Gamelan Tunas Mekar proposes to produce a video documenting its first twenty-five years, and culminating in a record of its planned return to Bali for the first time since 1996. This project will focus on the group’s origins and history, as well as its present membership and plans for the future. A central theme will be an examination of the group’s longevity, and the challenges that come with maintaining a community orchestra over such a span of time. With gradual changes in membership over many years, Tunas Mekar’s twenty-fifth anniversary represents an important opportunity to provide the most recent members with an experience of playing and hearing the music within the greater culture that it represents. Of equal importance is the need to reconnect with Balinese musicians and teachers who are important to Tunas Mekar’s past and future. 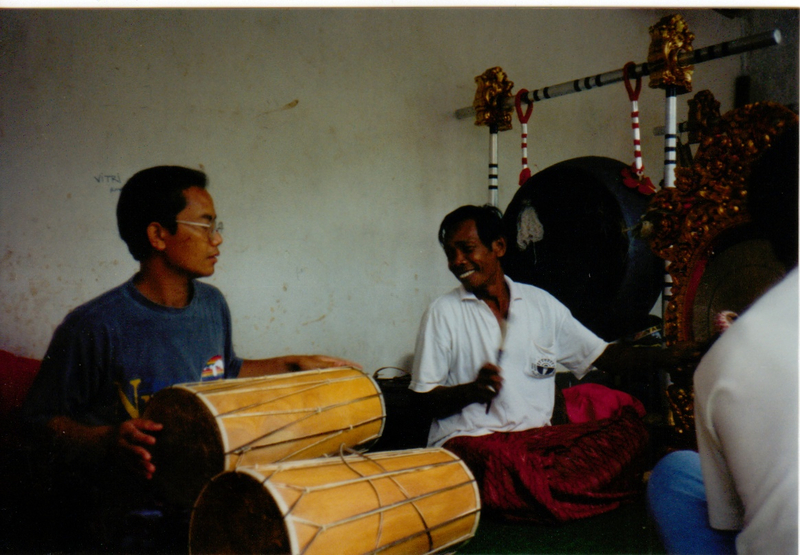 Our current teacher, I Made Lasmawan (left) and our first Balinese teacher, I Ketut Madri (right) pictured together here in Bali, 1996. The projected budget for this project, including video production costs, is twenty-five thousand dollars ($25,000). Our Indiegogo Project raised a little over $5,000 towards this goal. Tunas Mekar is seeking to raise this amount through private donations, which are tax deductible through the group’s 501(c)3 status. To produce a video documentary of one hour or more in length, chronicling the first twenty-five years of Gamelan Tunas Mekar’s history, in digital and DVD forms for distribution to pledge supporters and the public. To send the eighteen current members of Tunas Mekar to Bali, in order to provide them with a deeper understanding of Balinese culture through performing at secular and sacred events, and by reconnecting with the group’s historically established community there, with films and recordings made during this trip to be included in the Project Documentary. To bring a heightened awareness of Balinese performing traditions back to Denver, Colorado, USA, in order to continue Tunas Mekar’s mission of presenting traditional and new music and dance from Bali, Indonesia. Gamelan Tunas Mekar has always depended for its existence on donations, whether from within the group or without. Time has been donated by group members for rehearsals and performances. Rehearsal spaces, performance venues, and transportation have been donated by members, civic organizations and community business owners. The group’s hometown supporters have helped by purchasing tickets and recordings. Now Tunas Mekar asks for your support in funding the production of a documentary that will tell the story of its first twenty-five years, and will set the stage for its future. A return to Bali eighteen years after the group appeared at the Bali Arts Festival is a vital step toward that future, giving new members the chance to experience the music within the greater cultural context, and reconnecting with the musicians and villagers who make up Tunas Mekar’s Balinese community. A deeper understanding of the music and the cooperative society from which it has emerged will enhance Tunas Mekar’s ability to represent the Balinese idea of community in its home village of Denver, and throughout Colorado and the rest of the US. Your help, in the form of a tax-deductible contribution, will make this project possible, and will aid Tunas Mekar in continuing its mission of presenting the music and dance of Bali to American audiences. Click the donate button, then enter the amount of your donation. Get a “sneak peek” of the first five minutes of the documentary when it’s completed PLUS a digital download of Tunas Mekar’s live performance on KGNU Community Radio. Get all the above PLUS a Digital Download of the Documentary AND a Digital Download of Tunas Mekar’s cassette “Gamelan Tunas Mekar”! Get all the above PLUS a *signed* DVD of the All of the above PLUS a limited edition poster and a “book of the film” which includes exclusive content, stills and background information PLUS a digital download of our CD “Kembali ke Bali”. All of the above PLUS two VIP passes to join us at the world premiere screening of our documentary in Denver, CO, and a special thanks in the documentary credits PLUS a limited edition Tunas Mekar 25th Anniversary T-Shirt. All of the above PLUS a 1 hour gamelan angklung performance of music and dance by Tunas Mekar within 2 hours of Denver, CO. Performance must be scheduled by October 15, 2014. All of the VIP Patron perks PLUS a 1 hour gamelan semaradana performance of music and dance by Tunas Mekar within 2 hours of Denver, CO. Performance must be scheduled by October 15, 2014.